My wife has been wanting a nice bookcase for the guest room for a long time. 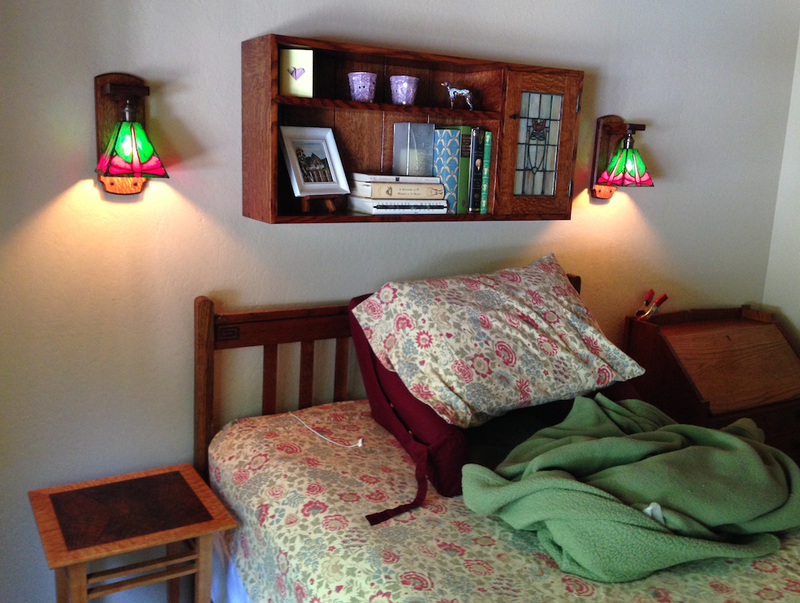 We recently redecorated that room with a wall cabinet, pair of stained glass sconces and a picture frame I made (plus paint), so the bookcase would finish the room off nicely. My first thought was to build the Limbert 355 bookcase. I like the design, it’s got a unique style and would hold a fair number of books. The Limbert 356 was the same basic design, but with two doors. This would be fun to make, but it was a no-sale with the wife. She wanted something shorter and wider. Maybe five feet wide or so, and three to four feet tall. I looked through all of my books and googled for images and plans to no avail. There were a couple of interesting hits, like this one by Kevin Rodel. I like this one a lot, but I don’t think I could pull off the inlay. 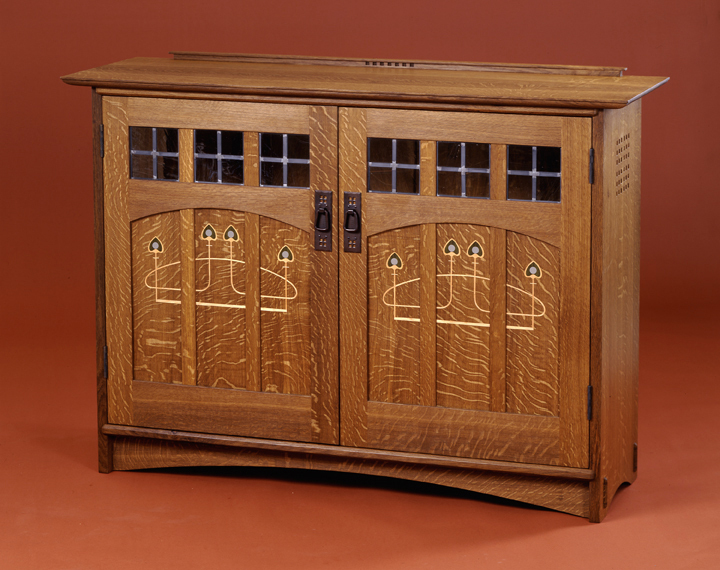 I know I’ll be making this in quartered white oak and dying it to match the other furniture I built for the room, so that would make the inlay dicey anyway. But it was a no-sale too — apparently we need to see the books in the bookcase. I did find one design my wife liked, although it doesn’t really work for me. It’s OK, just not enough visual excitement. It looks too close to some inexpensive plywood bookcases we want to get rid of. 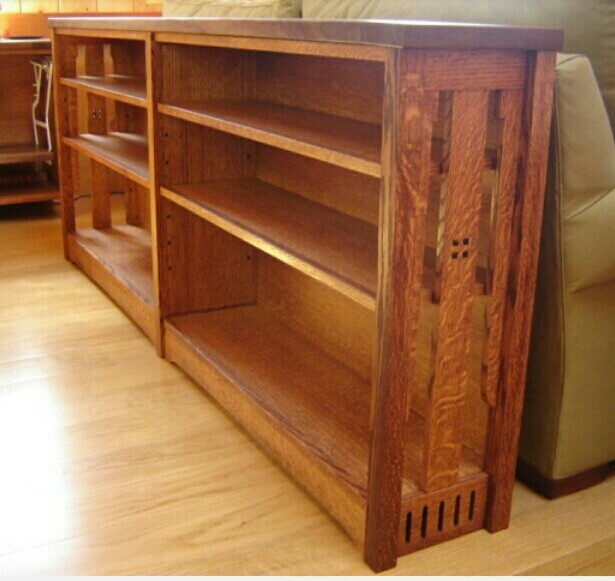 Wide mission-style bookcase I found on Pinterest — without any attribution. So I fired up my copy of SolidWorks and started doodling. I had an idea for a larger central unit flanked by two smaller bookcases that were shorter, narrower and set back from the main unit. I’m imagining the side units having doors with stained glass panels, and the middle unit being open to show off the best looking books. 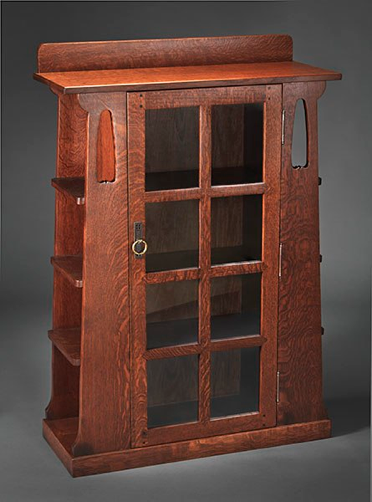 The top of each section would have short sides and a backsplash like a lot of Stickley serving tables. I started by blocking out the dimensions / proportions for the front view. This is just a simple 2D drawing at this point. I started by drawing a square 60″ wide and 42″ tall. I added lines to represent the major elements — center unit, side pods, shelves, backsplashes, and a door on one side for comparison. I tweaked the sizes and played with shapes until I had a sense of where I wanted to go with this. I settled on 42″ tall because I could get three generously tall shelves and a backsplash — and it would fit under the picture that I already hung in the room. The height for the shorter shelves is just what looked good to me at this stage, it will change as I go. The way I design I get the big bits in place, then start solving fit/clearance problems. 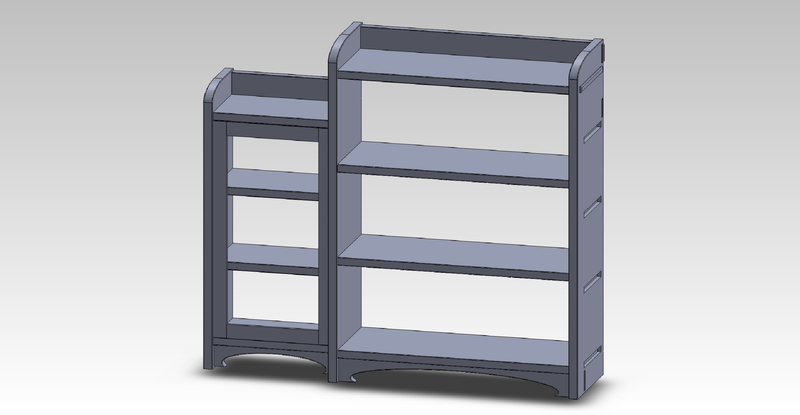 So I started by modeling the case sides and and central shelves. SolidWorks (and other 3D CAD programs) generally start by making a 2D drawing that is then “extruded” or otherwise manipulated to make a solid object. 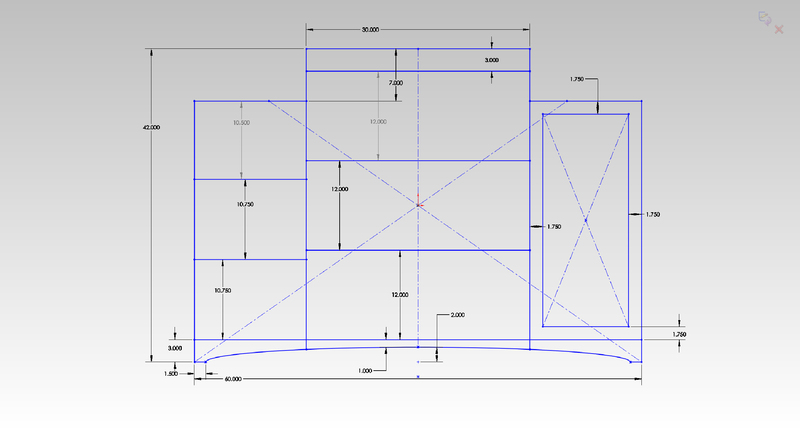 So if I were to draw a 12″ by 12″ 2D square and extrude that sketch 1″ I have a one board foot CAD model. If instead I rotate it around one side of the square I have a 12″ thick by 24″ diameter hockey puck. Most furniture is simple rectilinear parts, if I was trying to model a 1940 Ford where everything is changing radius surfaces it would be a much different story. Modeling this piece is just a process of drawing rectangles and extruding them into solids or extruding cuts into existing solids to make mortises or rabbets. 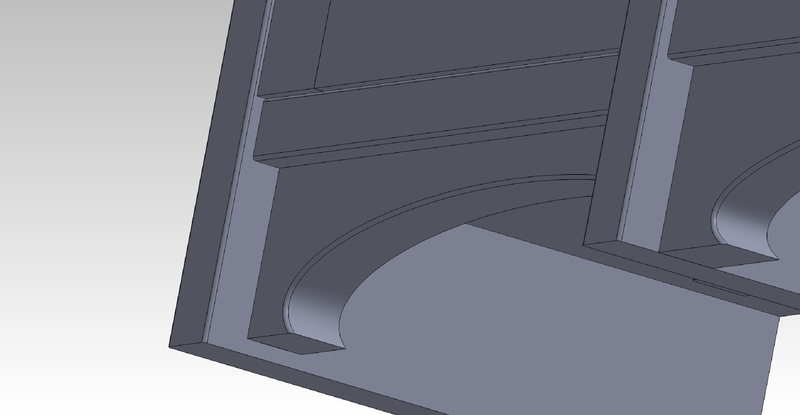 Step one, I’ve modeled one side and created a mirrored part — this is an incredibly useful feature in SolidWorks. The two parts are linked, so if I add a dado or move a mortise on the original part the mirrored part stays in sync. I modeled the shelves, backsplash and toe kick too, all as separate parts. These individual parts are mated together into an assembly. The top shelf has 1.375″ long tenons that protrude through the sides, the other shelves have .5″ tenons that fit into blind slots in the sides. I made the sides 1.125″ thick, and the shelves 1″ thick. There are lots of details to play with in the design, but at this stage I’m more focussed on blocking out the main elements. Should the backsplash be shorter or taller than the sides? Should it be flat or arched across the top? It doesn’t matter at this point. I need to get far enough along to verify the proportions in 3D and verify the fit of all of the parts. My next step is to model the outer sides and side shelves. The shelves in the main unit are 29″ wide right now. and I made the shelves in the sides 15″ wide. I set the depth of the sides at 10″ — that’s two inches shallower than the main unit. I wanted some set back on this, but as you’ll see this caused a problem as soon as I got a little further along. I only added the left side pod for now, assuming there will be problems to sort out before I go any further. You can see the blind mortises for the side shelves in this view on the right side of the model. I also modeled a door to fit into the left side opening. This should give me enough information to start troubleshooting the layout. Bookcase with central unit and the left side pod in place. The right side pod will be the same, but I don’t want to do that until I check the design proportions and fit of the individual parts first. So what are the problems I need to sort out? First, the setback on the side makes the toe kick on the side units look too far back. I think it’s just too severe at two inches of setback. I’m also concerned about running out of room for books — with the sides at 10″, a rebate for the back of a half inch, an inset door at least .75″ thick (it really wants to be .850″ thick to hold the stained glass with a retaining strip) I’m running out of depth for larger books. There is another problem with the depth of the sides — making the shelves shorter for the inset door runs into clearance problems with the through tenons in the side. It just barely works at this stage, meaning the front edge of the through tendon is still 1/8″ set back from the front edge of the shelf. But if I zoom in to look at the fit of the door — with the door tight against the shelves — let’s see what we have. This is looking up from ground level at the lower left side of the case. You can see that the door is sticking out in front of the lower shelf. On the side pods I want the top and bottom shelves to be set back from the sides by about .25″, with a tiny radius on the case sides. I want the door set back maybe 1/8″ to 1/4″ from the edge of those shelves. So, something here has to change, because this actually doesn’t work! There is also something wrong with the height of the toe kick, or at least the positioning of the toe kick on the left pod. I’ll need to investigate that. It should end at the floor level, but it short by maybe a quarter of an inch. My approach to fixing the problems so far is fairly obvious. I’m going to make the case sides wider, probably going from 10″ to 11″ – which will still give me a full inch of set back. I’m also going to shorten the length of the through mortises in the sides. Right now they are set at 1″ from the front and back of the case sides, I’ll change them all to 1.5″. That means editing the models for the sides and all of the shelves to adjust the tenons to match. Not a huge deal, but this is exactly why I didn’t want to get too far ahead of myself. I’ll also make the door thicker, and leave some clearance between the interior shelves and the inside of the door – at least 3/8″. There is another problem to sort out at this stage: the back. That meant that my starting position was a ship lapped back. 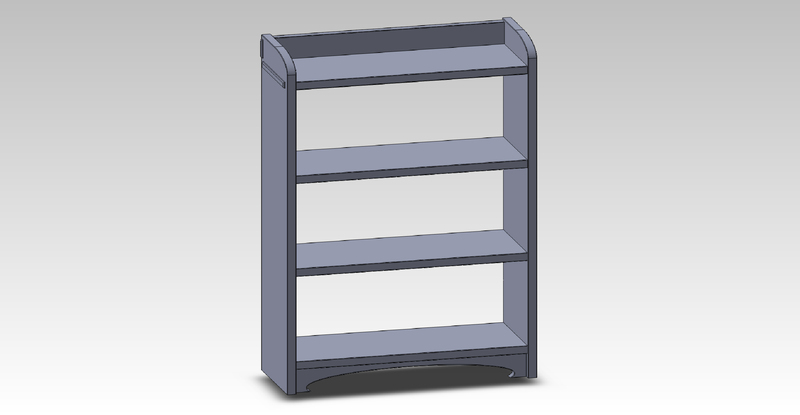 I modeled rabbits into the back edges of the case sides and top and bottom shelves, but let’s take a look at the back of the unit at this stage. I see a problem with the back here, how am I going to fit the back so that it’s attractive and strong? The red areas are the rabbets I have in the model at this point. From experience I know I need about 1/2″ of width to attach the back to the case with screws. With the case sides at 1.125″ thick, if I put a 1/2″ wide rabbet in for the back on the side pod I’ve got a 1/8″ of waste left. Of course I could just completely cut away the back of the tall sides at that point. I’m also concerned about where the gap between the slats will end up, I don’t want a gap between slats right next to the side. And I don’t want a slat that spans the tall case side because then it has to have a dog leg cut at the end. 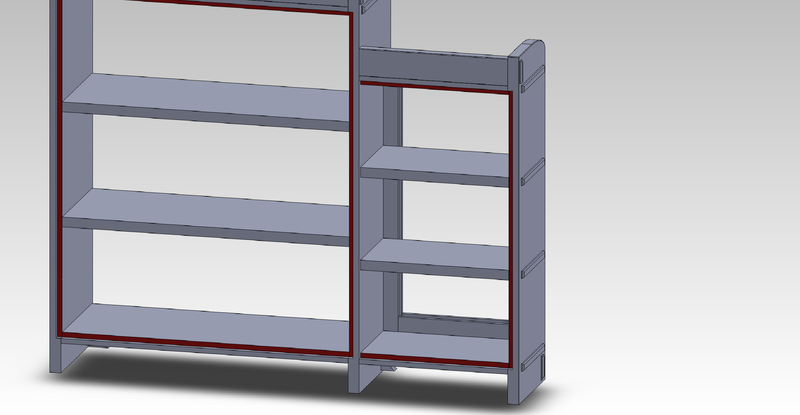 I think I can calculate the slat sizes properly so that they end up just right though. Another option for the back would be to make a frame and panel back. The downside with that is I’ll need to make the rabbets a bit deeper, probably 3/4″ for the frame. I’d want cross bars in the frame where the shelves so I can screw the back to the shelves, because the panels will be set back from the face of the frame. I’m not sure what I’d use for the panels if I went with tis approach. Plywood would be the simplest, and I could glue it into the slots in the frame without worrying about wood movement — that would make for a pretty strong back. But I would lose the ship lapped look. I think I will work out the first set of problems with the depth and door fitment, and then make two copies of the model. I’ll add a ship lapped back in one and try a frame and panel back in the other, and see what I prefer. I’ll post more on this as it develops. Re the bookcase – if you like the Kevin Rodel design, have a look at some of the Charles Rennie MacIntosh designs, as Rodel’s seems to be pulling its inspiration from there ? That has possibilities too. One advantage is that the sides of the case can be made with narrower boards and doesn’t have fussy fit around the through tenons. I don’t think the open sides will work with the “side pod” design I’m heading towards.